Creating lunches that are both interesting and nutritious for your children can be difficult. Some kids don’t mind eating the same thing every day, but for others, variety matters. 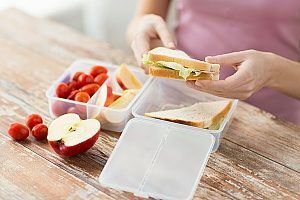 What matters for all kids, though, is safety and health, which is why it’s important to consider one other element of lunchtime: your children’s lunch containers. Many families don’t understand the importance of using BPA-free lunch boxes to pack their children’s lunches. BPA, however, is a dangerous chemical that can transfer from a plastic container to a child’s food, exposing them to a variety of potential health problems. Using metal BPA-free lunch boxes, like bento lunch boxes, can help protect children from this chemical. Here’s everything you need to know about BPA and why it should be avoided. BPA, or bisphenol-A, is a chemical that is used to make strong polycarbonate plastics. It can also be used to make epoxy resins, which are used to make liners that prevent metal corrosion. BPA can be found in a wide range of products today, including plastic containers, canned foods, toiletries, feminine hygiene products, thermal printer receipts, CDs and DVDs, eyeglass lenses, water bottles, baby bottles, bottle tops, and even water supply pipes. While many producers have switched to different types of plastic that do not contain harmful chemicals, there are many products that still contain BPA, and it’s important to carefully check labels and do research before purchasing plastic products. Plastics that are recyclable and have a 7 classification may contain BPA, while containers with a 1, 2, or 5 level are safer. BPA was invented in 1891 and mentioned in a scientific paper by Thomas Zincke at the University of Marburg, Germany in 1905. The plastic compound was widely used in the 1950s, when plastics of all kinds became extremely popular thanks to new materials, processes, and design techniques. In the 1930s, scientists found that BPA contained artificial estrogen. However, the dangers of this chemical were ignored, and BPA continued to be used. Polycarbonate plastic, which is made of BPA and phosgene COC12, was invented in 1953. It does not crack or break, and it became a favorite material for use in fuse boxes, displays, plug connections, and more. It was ultimately used in plastic bottles and can liners and was approved for use in food packaging in the 1960s. Dr. David Feldman, a Stanford professor, accidentally discovered the dangers of BPA in 1992. He and his team were studying estrogen activity and discovered an estrogenic molecule in a plastic flask containing yeast. As it turned out, the yeast was leaching estrogen from the plastic. Feldman and his team immediately realized that the estrogen-like molecule could be dangers to people eating out of plastic containers and began working to inform the public about this danger while asking plastic producers to seek alternative materials. Hundreds of studies were conducted in the following years to determine the toxicity of BPA and better understand its effects on human health. BPA was soon banned in Europe and Turkey after it was discovered that microwaved baby bottles were leaching BPA into milk. Canada, Denmark, and Japan followed suit. In the U.S., BPA is banned for use in children’s products in 11 states. BPA can easily leach into food and liquids stored in plastic containers, especially when the plastic is heated in the microwave. These estrogen-like chemicals can have negative effects on children and adults alike, though children are more susceptible to potential harm. According to over 130 studies, BPA can cause breast cancer and reproductive problems in women. It may also contribute to early puberty in girls, who typically begin that stage of life when they are around 10 years old. It can also cause infertility due to negative effects on male genital development and may lead to infertility in women as well. In addition to reproductive-related concerns, BPA can also have other negative effects on various systems. It may cause a disorder called atherosclerosis, a hardening of the arteries due to plaque buildup. This condition increases the risk of heart disease. BPA can also impair the development of the central nervous system by affecting brain development. Other research indicates that high exposure to BPA may lead to high blood pressure, prostate issues, and even changes in behavior. Avoiding BPA in your daily life isn’t impossible. Consider purchasing products that are labeled “BPA-free” and reducing your use of canned foods, which may be coated in a BPA resin. When reheating food, make sure to take it out of plastic containers, which can leach chemicals when heated. It is also advisable to avoid putting plastics in the dishwasher, though BPA-free lunch boxes are generally safe. Another way to protect your family from BPA is to purchase alternative materials, such as glass, porcelain, and stainless steel. For example, certain bento lunch boxes can help ensure that your children are not exposed to the toxic effects of BPA. Kangovou’s bento lunch boxes come in two sizes and are perfect for children of all ages. The stainless steel containers are double-walled, which helps food stay hot or cold and prevents the outside of the box from reaching uncomfortable temperatures. The easy-open lids are made of BPA-free plastic and lock tightly enough to prevent spills while also being easy for small children to open on their own. Kangovou’s bento lunch boxes also contain a sliding divider, which has several helpful benefits. The divider allows you to pack multiple foods in the same container, giving your family fewer boxes to wash, store, and carry around all day. It also helps improve portion control, making it easy to create nutritious lunches with the right balance of food to keep your children healthy and full all day. Bento lunch boxes are non-toxic and convenient BPA-free lunch boxes, and you can be sure that the lunches they contain will be safe to eat for you and your children.